Only five percent of the lawyers in the state are named by Super Lawyers and only 2.5 percent of the lawyers in the state are named to the Rising Stars list. 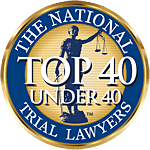 Lawyers are asked to nominate the best attorneys who are 40 or under, or who have been practicing for 10 years or less. They are instructed to nominate lawyers they have personally observed in action — whether as opposing counsel or co-counsel, or through other firsthand courtroom observation. To ensure a diverse and well-balanced list, the research staff considers factors such as firm size, practice area and geographic location. Super Lawyers was first published in 1991 by Law & Politics and was acquired by Thomson Reuters, Legal in February 2010. Thomson Reuters is the world's leading source of intelligent information for businesses and professionals. Super Lawyers can be found online at superlawyers.com where lawyers can be searched by practice area and location. Associates & Bruce L. Scheiner has been dedicated exclusively to representing plaintiffs in personal injury and wrongful death lawsuits. To find out more about their firm, please call them at 1-800-283-2900.